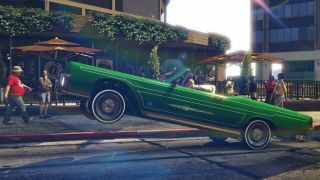 Rockstar has announced that lowriders are coming to GTA Online in an update scheduled for release next week. The Lowriders update brings a half-dozen new customizable vehicles to the game, which can then be tricked out from top to bottom at Benny's Original Motor Works, a new shop in downtown Strawberry. Lowrider mods include customized engine block covers and air filters, velour, leather, and patterned interiors, custom colors and designs for your "dials"—I'm not actually what that means, gauges maybe? Rims? I am not hip—and new steering wheels and shift levers. Hydraulics can be installed, naturally, as can upgraded speakers and subs for your window-rattling 8-track. Once your ride is almost kissing the asphalt, you'll be able to show it off with a "player interaction menu" that will open your doors, hood, and trunk, start the engine, and pump up the volume of your favorite radio station. But the real action will come from Lamar, who will dole out new missions as he climbs the social ladder, so to speak. A new Machete and full-auto Machine Pistol will be available at Ammu-Nation, and players will also now be able to purchase a fourth property, providing room for an expanded fleet of vehicles. GTA Online Lowriders will go live on October 20. Details are up at Rockstargames.com.